Columbia Pictures was planning to make Anaconda, a feature film starring Jennifer Lopez, Ice Cube, and Jon Voight. The story revolved around the legend of a giant snake and what happens when a documentary crew actually finds it. The script was inspired by real-life discoveries of increasingly larger snakes – some reaching well over 35 feet – that have even swallowed humans. Knowing that the use of a real snake was out of the question (the last thing a snake would do is move on cue), the studio enlisted Walt and his company, Edge Innovations, to create the title characters of the film. 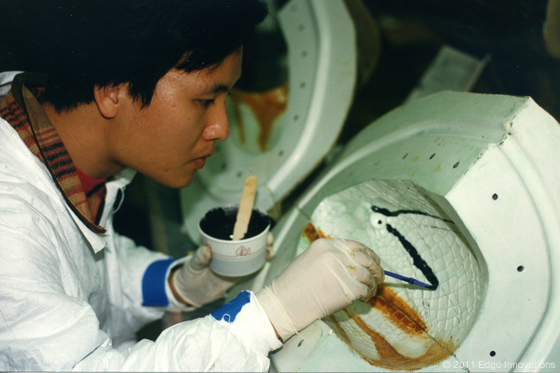 The most daunting animatronic challenge has to be replicating a snake. Achieving that characteristic sinuous movement requires a large number of individually controlled joints, all packaged in a long and very slender form. Even if a snake can be built, how do you control dozens of joints so that the snake can “perform” live with actors in the unpredictable environment of a film set? The requirement of fitting so many joints inside such a slender form factor posed a huge engineering challenge. The usual approach of using commercially available actuators and servo-valves was not an option because of space constraints. 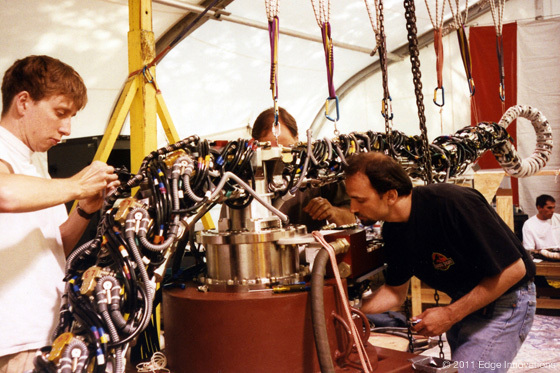 Instead, the engineering team had to develop a highly integrated and custom design that combined structural and hydraulic functions. 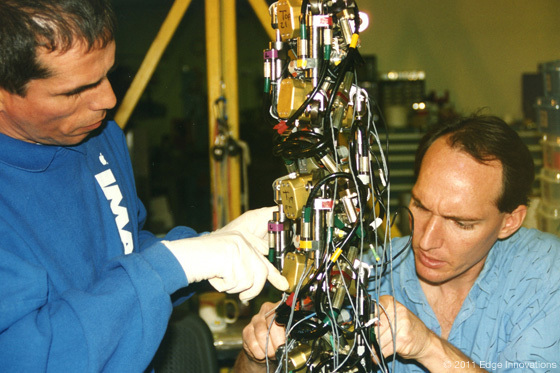 Each link served as a structural member as well as the body of two high performance servo-valves. In addition, 20 different size cylinders and dozens of styles of hydraulic fittings had to be custom designed. 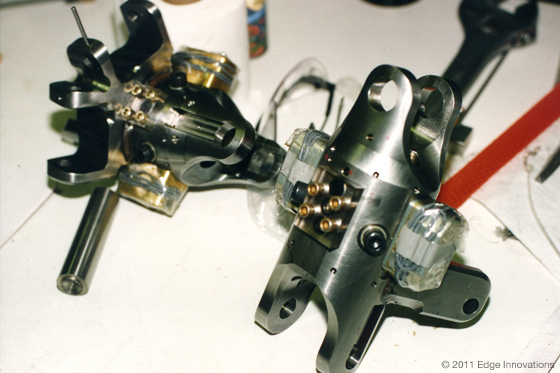 In the end, each of the 60 links contained almost 200 custom mechanical parts. Wiring and plumbing also proved a great challenge. 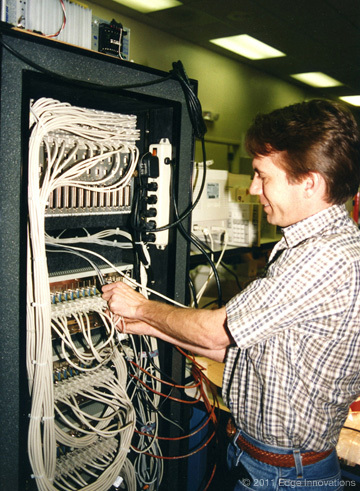 The snake’s 480 analog channels were connected to the control system using over 40 miles of custom wire. 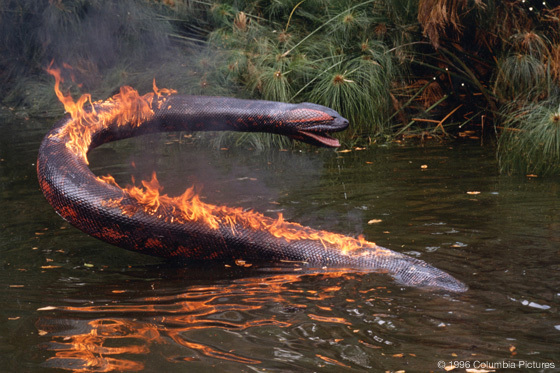 And because much of the film’s action takes place in the water, all elements inside the snake had to be waterproof. 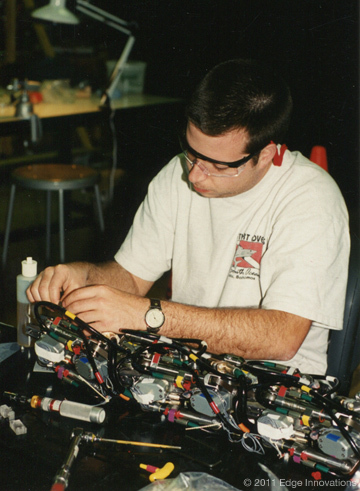 At the time the snake was built there was no control system capable of controlling this 120-axis robot. So the Edge team built a real-time control system from the ground up. 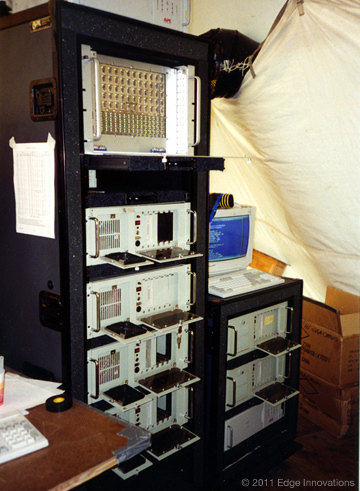 The system consisted of 60 Digital Signal Processor (DSP) cards and seven Pentium processors. The DSP cards performed geometric transformations and closed the control loop for each link, while the Pentium processors coordinated the commands across all links. All software was written from scratch. 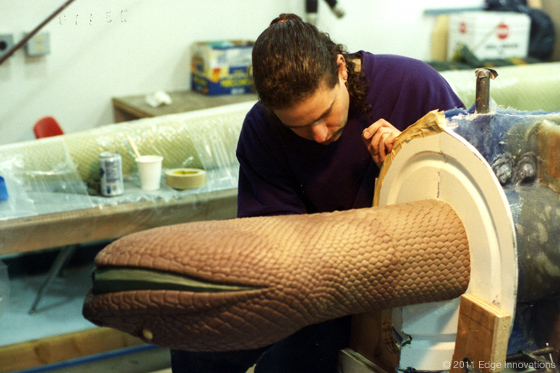 Beyond controlling the snake, the Edge team also had to develop a “performance” system that allowed the snake to adapt to variations in an actor’s performance. No two takes are ever exactly the same. Animatronic characters are usually “performed” live by a group of puppeteers each controlling a few functions and all working together in a coordinated fashion. In the case of a snake with 120 axes, however, this was impossible. To meet the challenge a custom system was developed that combined splining software with a “time slider,” thereby allowing a single person to synchronize the timing of the snake’s performance with the actor’s pacing while the cameras rolled. 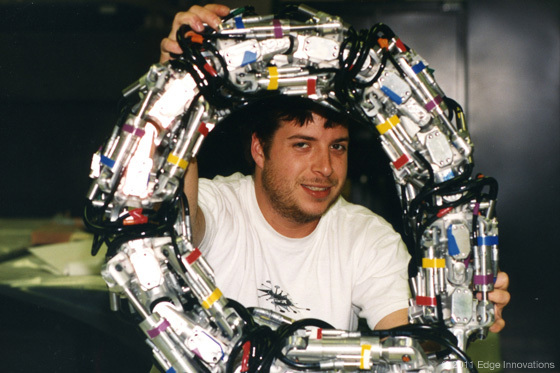 The engineering achievement of the snake ratchets up even further when one considers it was developed in only seven months (by a team of 80), from concept to delivery. It is a powerful testament to what a focused and motivated team of talented individuals can accomplish in a short amount of time. The animatronic anaconda was widely lauded by both popular media and engineering trade journals throughout the world. 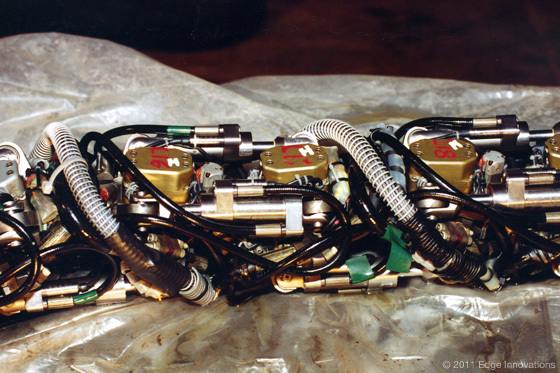 To this day the snake remains the most complex, serially linked robot in the world.